Some trips make it easier to justify splurges. And no vacation is more splurge-worthy than your honeymoon. That's why my wife and I chose to break open our piggy banks and go on a safari in Botswana. Nothing about our trip was cheap. The flights, the safari camps, and the immunizations all required some heavy credit cards swipes. So, when it came time to prepare myself to document the trip, I didn't want to cut corners. However, I am by no means a professional photographer. 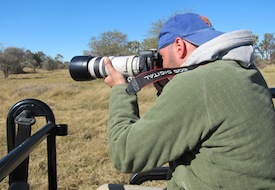 I have a digital SLR camera, but the idea of investing in an expensive telephoto lens for the safari seemed wasteful. I had no idea when I might need such a large lens again in the future, but I also didn't want to spend all of that money on our trip only to have horrible photos simply because we didn't have the proper equipment. That's when it hit me: I could rent a lens. If there's one way to save money on a safari - or any type of wildlife vacation - it's to rent gear rather than purchasing it unnecessarily. With the trip over, I can now safely say that renting a lens from Borrowlenses.com was one of the smartest decisions I have ever made. Several of my photographer friends told me that going on safari without a telephoto lens would be a tragic mistake. However, the lens that they most frequently recommended, a Canon 100-400mm, retails for about $1600. I was not about to spend that amount of money on camera gear when I can only honestly describe myself as a hobbyist. That's where Borrowlenses.com came in. Their charge for a two-week rental of that lens : $113. It's significantly easier to justify spending $113 for some of the most fantastic photographs I've ever taken - and breathtaking reminders of our honeymoon - than spending $1600 that we should be saving for our future. Plenty of photography shops offer lens rentals. However, not everyone lives in a town with such establishments. The other issue with renting from a shop: finding time immediately before and after a trip to pick up and drop off the lens. The beauty of Borrowlenses.com is that they ship the lens to your home and include a prepaid FedEx shipping label with which you return it. After two weeks in Africa, the last thing I needed when I got home was an extra errand to run to a camera shop, so simply placing the lens back in its original box, slapping on the label, and handing it to the FedEx guy when he stopped by my building was perfect. I got the lens I needed at a price I could afford with minimal effort on my part. The next time you're taking a trip that merits an upgrade in your camera gear, consider renting rather than buying. You can test out gear before investing in it, avoid purchasing equipment that you won't use often, and save an incredible amount of money. And, if you're going to rent, check out Borrowlenses.com.